Let’s face it: moving is usually not a joyous occasion. Relocating may be, but the actual move is often a lot of work. 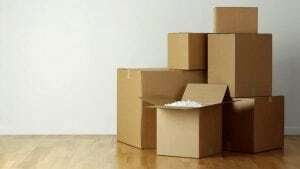 Moving can put a lot of stress on people, particularly large families or those with small children, though it’s not a walk in the park for anyone. It’s inconvenient, time-consuming, and labor-intensive, unless you hire a professional company to do all the hard work for you. The days leading up to a move notoriously involve forgetting to pack something, forgetting to not pack something, not having enough boxes or tape, having more stuff than you thought you did, etc., so we’ve got twenty tips from the pros here at Marrin’s Mooving near Raleigh, NC that are sure to make the process a little easier on you, and who wouldn’t want that? So here are our trusted moving “hacks” to ensure a more peaceful, less strenuous move the next time you’re ready to pack up and move on. 1. Plastic wrap your drawers. This will ensure they don’t pop out while moving furniture, and it also means you don’t have to worry about taking them out or emptying them, using more boxes and storage space. 2. Protect your plates and bowls by placing a single layer of packing paper or bubble wrap between them for cushioning. It’s also easy to put a paper or Styrofoam plate between your plates. 3. Plan and pack a “first night/day” bag for when you get to where you’re going. Moving is tiring, and no matter how ambitious you feel about all you’ll accomplish when you get to your new home, it’s likely you wont get as far a you intend. Pack a bag of things you’ll definitely want or need when you arrive, at least enough to get you through the first 24 hours so you can have time to get some sleep and start sorting through your boxes. Include things like clothes, pajamas, bedding, toiletries, plates, cups, food, etc. 4. Use bar soap to fill in nail holes for a convenient, cheap alternative to messier approaches. 5. Keep your wires and cables from tangling by running them through leftover paper towel or toilet paper holders. 6. Ensure your toiletries, etc. don’t spill and make a mess by putting plastic wrap under the caps. 7. Label boxes with the contents of the box and the room the box should go to to save time and better direct you and your moving helpers. 8. Pack plates vertically so they’re less likely to break from being sat down too hard. 9. Don’t waste time or money loading all your clothes into wardrobe boxes or even taking them off their hangers. Instead, take a large trash bag, open it, and engulf your clothes in it, from the bottom up. Cinch and tie with the hangers sticking out of the top. That way, all you have to do at your new home is untie the big and hang them up. 10. Use all your suitcases and bags to save money on boxes. 11. Put essential appliances (like your hair dryer or coffee machine) in a laundry basket so you can put them on your counter right away in your new place. 12. Color code each box according to room so you can easily identify what needs to go where. 13. Cut triangles in your boxes to give yourself better grip for carrying. 14. Make a thorough list of all the places with which you need to change your address ahead of time so you can focus purely on unpacking when you arrive at your new house. 15. Keep hardware organized in sandwich bags. 16. Keep packing supplies in a basket that you can easily take them wherever needed. 17. Take labeling your boxes a step further with a drawn-out key that tells you where you want everything to go. 18. Plan ahead and have storage containers for your holiday items and things that will be going in your attic so they’re not sitting around. 19. Pack jewelry in clean egg cartons to keep it tangle-free and organized during the move. 20. Lighten your load by having a moving sale or giving items away you no longer need ahead of time. Hope that helps! For more help with moving, contact our team at Marrins Moving in Morrisville, NC!